Colorado Kayak Supply, online at ColoradoKayak.com, is the perfect store for those of you who love kayaking. Find all the gear and equipment you need to start your kayak adventures and more with Colorado Kayak. Among the products Colorado Kayak has to offer are men’s and women’s apparel suitable for the water, kayaks, paddles, lifejackets, and more. Even find equipment for other outdoors activities including fishing gear, tubing gear, camping supplies, rafting equipment and much more. Colorado Kayak offers great brands including Astral, Jackson, Pyranha, Teva, Lendal, Down River, Predator and more. So checkout the huge inventory that Colorado Kayak supply offers its customers. First, stop by RetailSteal.com to find Colorado Kayak Supply coupons, Colorado Kayak Supply discounts, and Colorado Kayak Supply promotions. Shipping rates with Colorado Kayak supply vary depending on whether you purchase accessories, kayaks, rafts, paddles, or if you choose international shipping or expedited shipping. Shipping to Hawaii and Alaska is an option. See website for full details, exclusions may apply. Right now save up to 50% or more on Clearance - closeout items from ColoradoKayak.com. Click link for selection. Check out the deals of the week at Colorado Kayak Supply and save up to $100 or more. Click link to view. Enjoy free shipping on orders of $50 or more from Colorado Kayak Supply. Click link to start shopping. Check out Colorado Kayak Supply and get $100 store credit with select kayak purchases. Click here to get started. Enjoy discounts of up to 60% or more on Scratch & Dent items from Colorado Kayak Supply. Click link to view. Save up to 40% or more on paddling apparel from Colorado Kayak Supply. Click link for selection. Head on over to Colorado Kayak Supply to save 20% on Boat & Board Packages. Click link to view. Save $15 on your Colorado Kayak Supply accessory purchase of $100 or more when you enter this promotional code at checkout! Enjoy free ground shipping on your entire order from Colorado Kayak Supply when you use this coupon code online. 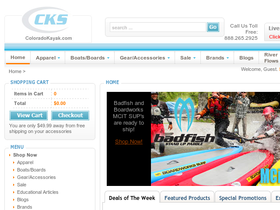 Shop online at Colorado Kayak Supply today and save 10% on all accessories when you enter our coupon code at checkout. Use our coupon code at Colorado Kayak Supply today and save 10% on boat accessories. Click the link to head over now. Use this coupon code on Colorado Kayak Supply to get a Free Thermal with your 2014 KOKATAT Drysuit Purchase. Click to save.